I was in Sir Davids house in Richmond, West London, to talk about his new series Life of Birds. It is another of his great landmarks in wildlife film making, an odyssey to the furthest corners of the world, every bit as ambitious and world-ranging as his Life trilogy and the recent Private Life of Plants. 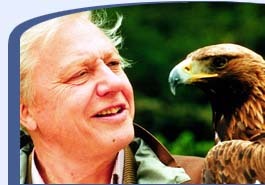 Sir David is, by common consent, the worlds master wildlife documentary presenter. His power of story telling is legendary. In a few moments I were airborn and travelling the world in my imagination for a rapid minds eye tour to far-off locations from the ten programs. Soon we were on the beach on Hood Island in the Galapagos as the tropical breakers crashed in, and the waved albatrosses lumbered out of the surf and took off towards the camera like antique bombers. Then on to the Atlantic rain forest in Brazil as the loudest avian sound of all, the deafening call of the bell bird, echoed through the trees. And, as we listened, humming birds like tiny feathered jewels waltzed around our heads. We watched under the permanent drizzle of the Iguacu Falls in Paraguay as dusky swifts zipped through the towering curtain of water to their nests. In the Kalahari lanner falcons dropped with devastating speed into a flock of Cape pigeons. On the edge of a lake in Upper New York State the returning loons, the great northern divers, called poignantly over water as still as platinum. Then, as we came in to land, Sir David made an unexpected admission. When the BBCs Natural History Unit first asked him to make the series he wondered if he was the best person for the job. Nobody who knows his work over 40 years could doubt that he was the clear first choice. He is one of Britains foremost broadcasters, and one of the last of the great on-screen presenters. In Britain he is a household name, and, among those who are not royalty, movie, music or sports stars or politicians, one of the few people to be recognised in the street. Modesty is one of his endearing qualities. His little knowledge is equivalent to most people's great learning. Like all his series, Life of Birds is very much his series, written to his own words, put together largely as he planned it. His rare skill is being able to compress often complex behaviour into a succinct and understandable film sequence, and deliver it to a script which is a model of precision. Birds are the most popular group in the animal kingdom. We feed them and tame them and think we know them. And yet they inhabit a world which is really rather mysterious. Once they take off from our bird tables or our lawns they disappear into a world of their own. What I am interested in with birds, just as I am with spiders or monkeys, is what they do and why they do it. This is what the series is about. A fat file of notes accumulated. Only then did Sir David begin his travels. He covered 256,000 miles in the making of the series, 10 times round the Earth. He didnt go everywhere, but tried to be on hand for most of the key filming moments all over the planet. As ever, he was in the thick of the action. In South America he conversed with megallanic woodpecker, through tree-tapping. In Australia rainbow lorkeets walk all over him. In Scotland a capercaillie knocks him down, while in the Seychelles his commentary is drowned out by sooty terns. He admits to several passages of discomfort: the worst was in a cave in Venezuela when oilbirds were being filmed. 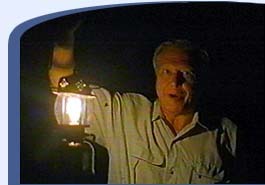 The crew used infra-red cameras, leaving Sir David in the pitch dark with no light to see the rats, mice, bats and insects scurrying up his legs or flying around his face. He writes all his own scripts. His skill as a writer is often overlookedhe won a prestigious literary prize in Britain for the book of the series, even before the series itself had been screened. Sir David is the last of the pioneer generation of television presenters, bright young people who came into the field in the 1950s when TV was still an Awfully Big Adventure. It is hard to believe that he was turned down for his first job in radio; he was quickly invited to join the nascent form of TV. He made some of the first black and white TV nature films, then rose to be the BBCs director of TV programmes when colour TV was being introduced in Britain. Since he returned to film making in the 1970s his career has been an unbroken sequence of successes. For 20 years he has been making massive wildlife films; his biggest opus was the Life trilogy, an account of wildlife on this planet from 3 million years ago to today. He became the master of the epic split sentence, begin in Africa and completed half a world away in South America. Sir David lives in Richmond, quite close to his brother the actor/director Richard (Lord) Attenborough. 72 now, he displays the vitality of a man many years younger. His wife Lady Jane died two years ago during the making of this series - they were a devoted couple and had been married for over 40 years. His daughter Susan now runs his business affairs. But all his producers know it is he who is the consummate professional, delivering his commentary to camera with very few takes. He will usually oblige their whims. 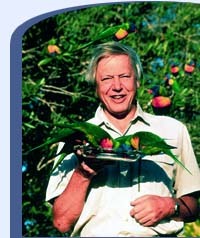 He famously abseiled down a rainforest tree in Private Life of Plants in his late 60s. He went into a termite's nest in Africa, amd let himself be attacked by military ants. Indeed he has only two aversions: the rat, and anywherelike dark caveswhere there may be rats. At quiet monents on set he will retire to his tent to listen to classical music on CDs, then emerge in the evening to regail the film crew with his famous fund of travellers tales. He said this of Life of Birds. It was a most illiuminating and joyful experience. I travelled with the best cameramen to all the dramatic sites in the world. If you spend three years thinking about nothing but birds, you end up considering them in quite a new way. My reaction used to be like most peoples when a bird come into may garden. I would look at it in the same way. It flutters down. Aren't its wings nice. Look, it's feeding. Now its flown away. But if you have just done a program about warning behviour or mate guarding, you see quite different things. So it's Look, his mate has come as well, and hes guarding her, and see how he reacts to a threat. You now have this insight; things suddenly fall into place, and you start to see things that have been going on before your eyes all your life and never understood. It is not until you get this kind of directed curiosity, with a very knowledgeable ornithologist at your elbow, that you really begin to see these things. After this series I no longer watch, say, a pigeon drop from the sky into my garden in the same way as I used to. I know more about it; I have more empathy with it. I understand its problems and its abilities more than I ever did before. Its not enough for us to just put a name to a bird and look at because its pretty. We see only a tiny fraction of a birds existence. There is a huge amount of its life that we have no knowledge of. I hope this series will enable people to get inside the mind of a bird. There are birds far out on the open sea. Birds go to the poles, and survive extremely low temperatures. Birds go underwater. They have been seen diving to 1000 feet. Birds have colonised the air in a fantastic way. They even fly over the Himalayas. Swifts stay on the wing nearly all their lives, making nests of bits of fluff they catch in the air. They even mate in the air. How can he chose a favourite out of the fabulous parade of birds he has seen in making the programme? But he admits has always been greatly moved by the beauty of one species, the birds of paradise. They are some of the great wildlife spectacles, among the most beautiful and fantastically decorative birds in the world.